Jim has worked in the industry for over 30 years. 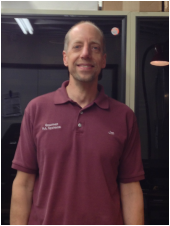 He's widely known as the "go-to guy" when it comes to service not only in the Pittsburgh area, but across the country. His ear for music, second-to-none instincts, and overall knowledge of the industry has contributed to his success. 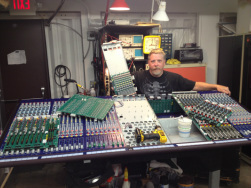 No two days are the same for Jim, as one day you'll find him elbow deep in a high-voltage amplifier, the next day he'll troubleshooting a large format mixing console. Jim oversees anything and everything in the company, and strives to continue to build his abilities as the industry changes. Cricker has also been around the music industry for quite a while. After joining the team in 2009, Given his gifted mechanical abilities, Cricker has fully embraced the service His super power to do "CSI" levels of work on audio/lighting gear make him a valuable member, and contributes greatly to the Gourmet PA's quality service. Previous to joining the company, he has gathered experience both in the professional lighting end of the industry, and working in mechanics. Justin is a graduate from Penn State University, with a degree in Journalism. In 2007-2008, he apprenticed with Gourmet PA Systems, learning the ins and outs of the business. After graduating, he came back to work for Gourmet PA as the Office and Technology Manager. His typical day consists of managing the company website and social media, following up with repairs, speaking with vendors, running accounts payable/receivable, and repairing computers. Justin strives for satisfaction with every customer. He will be the person checking your gear in, gathering information to aid Jim and Cricker for the repairs.